More revelations from one of the epicenters of the housing implosion. 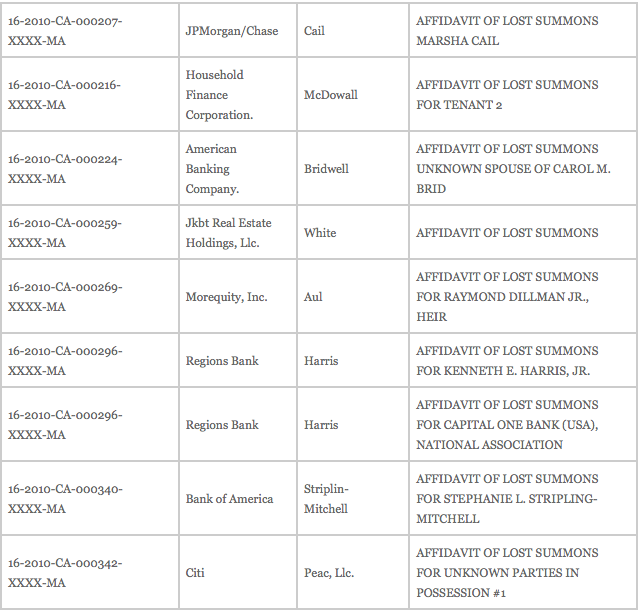 4ClosureFraud has published an eyepoppingly long list of affidavits of lost summons in foreclosure cases. I spoke to the individuals who compiled this sample; the roster on the 4ClosureFraud site is from DuVal county only. They’ve pulled records from across the state and find similar high volumes in every county. They have refined their queries to exclude judicial notices that are not germane and are up to nearly 9000 questionable notices of lost summons, nearly all from 2010 (in three counties, they have gone into 2009 records). They are in the process of drilling back in time to come up with a more definitive figure. One has to remember the timetable here: foreclosure notices take place during an active phase of the entire foreclosure process. What are the odds that these “lost” notices reflect legitimate lost documents, as opposed to failure to provide proper notice at all and lying to the court after the fact? The sheer volume strongly suggests the overwhelming majority are the result of the utter disregard of the foreclosure mills for due process. As noted earlier, this sample is from DuVal county (see the CA in the case identifier). And notice how many look bogus; they don’t even have the borrower’s name on them (“for unknown tenants/owners”, “for Mortgage Electronic Registry Services”; many in the name of Jane or John Doe). Yves here. Mind you, this is a report from a few years ago; foreclosure volumes have exploded since then. How hard is it to imagine that the foreclosure mills are simply skipping this step more than occasionally in districts with bank-friendly judges? Make no mistake about it: the nature and scale of these frauds cut at the very heart of our judicial process. We didn’t call the Florida courts “kangaroo courts” lightly. A home is most people’s most important asset; shelter is a bedrock of personal security. Both the Fifth and the Fourteenth amendments enshrine the notion of due process, yet we see increasing evidence of it being violated on a routine basis in the Sunshine State. This entry was posted in Banana republic, Banking industry, Credit markets, Legal, Real estate on October 3, 2010 by Yves Smith. I think either the government needs to declare martial law, or maybe congress pass a constitutional amendment stating that foreclosure notices can be sent via registered mail, instead of having people burning up our gasoline (none of which comes from the deepwater gulf at the moment) driving around to 10 million households delivering this document, and next the Fed will do $10 trillion in QE2,3,4 and 5 to fix the problem. Otherwise this country really will go under. Then, after the Post Office has completed delivery, I would give them a medal for saving the country. Personal service is absolutely critical – the bedrock of our rule of law. In some circumstances it can be done by registered mail, in some it can be done by swearing that you followed a very specific procedure and couldn’t find the person. In some places it can be nailed to the door. We don’t need to make it easier, even though it really holds things up, because a lot of assumptions that the law makes flow from that original notice coming to the defendant so that they choose to ignore the proceedings. What on earth would make you want to remove protections for the defendant? Incredibly short-sighted. Some number of people, knowing that a USPS registered letter could be a summons, will refuse to sign for it or will refuse to pick it up at the PO (if they managed to avoid the postman’s initial attempts at delivery). It is difficult to respond to that statement civily, not only because it signals such a profound ignorance of the United States Constitution, but also because it so cavalierly advocates sweeping away our civil rights. Cedric, the congress doesn’t “pass” constitutional amendments. I think/hope he was being sarcastic. Honestly how many of these improper foreclosure methods have been initiated upon loans that were performing? They’ve found close to 9000 suspicious cases and have only gotten fully though one year (and 2010 is not a full calendar year). Say only 80% are fabricated (this is being too fair to the foreclosure mills). I’d say the odds are high you are looking at easily over 20,000 failures to provide personal service. As I have indicated before, there have been PLENTY of examples of people being foreclosed upon improperly/incorrectly: as a result of servicing errors, efforts to improperly break a bankruptcy stay; the foreclosure grinding forward EVEN WHILE MOD DISCUSSIONS WERE UNDERWAY because the servicer didn’t inform the foreclosure mill and the foreclosure mill will not check back with the mother ship once it has a meal ticket in hand. So say 10% of those 20K foreclosures without notice should not have happened for the reasons above. That means 2000+ people in Florida had their homes stolen from them. You think this isn’t a big deal? Honestly, what planet are you from? Thank you Yves for writing back. I have a been a big fan for years and I appreciate your technical rigor, getting past the headlines and connecting the path to make a cohesive and informative story with motive. I think we’re correctly starting out with the assumption that the debtor isn’t in default and the burden of proof lies with the servicer. My question is that how many performing loans, loans NOT in default, have faced notice or actual foreclosure? The situation you describe reminds me of the two Gura wins where if someone wanted to overturn the lautenburg amend they wouldn’t seek a plaintiff had a lengthy history of domestic violence convictions. He found 2 people with spotless records. When a loan is in MOD, that is a loan in default. A restructuring of the original terms for the benefit of the debtor. Has anyone had their ‘home stolen from them’ and was current on their mortgage? Theft implies ownership, which if you are in default, is the exact point of contention and the contract states you give up the collateral, in this case which is a house. You are right and people should receive due process of law, but what is the effect of these errors? Moving through the foreclosure process on a defaulted mortgage sooner? Is that a bad outcome? I think finding the bottom sooner is better than later. And now since these foreclosures are on hold, what is the benefit to the debtor? A few months of free rent? This definitely sounds like a bigger problem and can see the deceit in the practice. I just can’t imagine getting into a MOD after reading what CalculatedRisk wrote about how they actually work. It sounds similar to a ‘debt consolidation’ company that tries to get a couple hundred bucks a month when bankruptcy is imminent. I’m not saying you’re incorrect Yves, it just the magnitude of this issue seems overblown. Actually, the foreclosure issue is the tip of the iceberg. When a person finishes paying for their home, they get the deed, right? But what if the lender can’t give them a valid deed? What if it’s tainted by any of the issues that taint the deeds and notes presently involved in foreclosures? It’s fixable, of course. All you need is an unimpeachable professional who has true knowledge of the note… yeah. Want a fun scam to worry about in a decade? You get a letter or a visitor that says your title is invalid, that they’ve got the clear title. Since they don’t really want the property they are willing to take a little cash to go away. Maybe more to sign over the title they’ve got. Documents? All they really need to do is prove to you that your title is unclear because the lender’s possession and transfer was undocumented or tainted by fraud. Even if you manage to dump the scam artist, you still now face the problems when you try to sell your home. Yves, there are so many layers to this Mortgage FUBAR. I tend to think the RMBS/Trust/chain of title issue might be the most damaging to the banks in the medium-term. Not that improper service, fraudulent docs, etc. aren’t a HUGE problem. So, on top of more strategic defaulters getting many years without paying (where’s the note? ), now you have institutional investors with institutional lawyers and well-established trust law asking for their money back and requiring real dollar payments in the short-term (as opposed to just a lack of cash flow over time). I would tell people to squat in their own homes for as long as they can. Sure, when the lending institutions are in trouble they get bailed out by the gov’t. When honest families lose their homes to the foreclosure crisis who is bailing them out? HardCorps — While I disagree with your premise your assumption is also incorrect. It’s extremely common lately for servicing companies (the entity people think of as “their bank”) to put people in trial modifications but they put the monthly payments into escrow accounts. Then, after a few missed months of payments — because the money is flowing into escrow accounts, with the consent of both parties — they foreclose. This is incredibly common: we hear stories about it every day. So while I think people deserve notice whether they’re current or not, the truth is that lots of people who in good faith think that they’re current — who have contracts saying so (they didn’t read some line in the 2-point type) — end up foreclosed on, and sometimes not even knowing it. If you want to know why servicing companies do this that’s easy: they get paid higher fees for a loan in default from the trust that hired them, plus they get their HAMP money too. There’s no downside to pushing a note into default and lots of upside. And that’s really the bottom line – these guys are making money off of foreclosures. It doesn’t what’s best financially for the home owner or the note holder. I am going to go out on a limb and and conjecture that the Supreme Court may need to nullify the tenth amendment in order to address this problem. State law governing title transfers goes back deep into the nineteenth century and before. It developed in response, in part, to the many incidents of land fraud that occurred throughout our nation’s formative years as the frontier expanded and speculators played upon the hopes of a growing nation. These laws, moreover, while differing in degree and detail from state to state, are uniformly and firmly principled upon the premise that a proper transfer of ownership must be evidenced by a satisfactory and demonstrable paper trail. Today it appears that some vast number of mortgages have been transferred in a manner directly forbidden by as many as 45 of our United States. Moreover it appears that this practice has been ongoing for five or more years and that the dollar amounts involved may reached upwards of four trillion dollars. The political powers that be in Washington today cannot possibly bring themselves to reach the conclusion that all of those trillions in mortgage securities which are backed up by these fraudulent conveyances are in fact worthless pieces of paper and that, in consequence, hundreds of thousands of individual home owners (whether deserving or not) have been deprived of property though a fraudulent foreclosure practice. In short, the only solution that will protect the interests of those who lobby our great legislators must be an ex-post federalization of all mortgage law and, with it, a wholesale repudiation of the tenth amendment. Anything less, even with the help of understanding and co-operative judges (e.g., Palm Beach’s notorious “Rocket Docket”) will leave the resolution of this problem to disparate judges throughout the country to decide. And, it may well be feared, if this were allowed to happen (as it most certainly would without strong federal leadership), too many of these jurists would be liable to reach conclusions insufficiently tempered by economic reality and overly infected with a romantic affinity for “due process”. I rather expect Team Obama to spin this somewhat differently with language that suggests that the government is stepping in to shore up the real estate market, to stabilize home prices, and to assure stability in the world’s largest securities market. Follow up: Actually, my wife (who’s a lawyer) says it’s more likely to be a fifth amendment issue (due process) rather than a tenth amendment issue. I am not a lawyer so I am happy to take my lumps on this one. Ditto to you what I said to Cedric above. Diogenes, the Supreme Court can’t nullify provisions of the United States Constitution. Or maybe that’s what you and Cedric are advocating, that whoever is in office just discard the Constitution (that is the rule of law) and we descend into rule by strong men? I never thought I would agree with DownSouth so emphatically. That said, the overly expansive interpretations of the Commerce Clause has relegated this amendment to a primarily decorative function already. “Creative” liberal justices strike again. There are so many bizarre opinions in this short comment from Eagle that it’s difficult to know where to begin. First, the commerce clause is pretty clear, and it is entirely reasonable to hold the opinion that most of the SCOTUS rulings on it are not overly expansive. Yes, we have a lot more interstate commerce now. If that is your problem, move to a smaller country. Second, whatever your definitions of “conservative” and “liberal” are (and yes, there are *many* definitions of these words), there are justices that would fit almost any of the definitions of “conservative” and have used the commerce clause to shape the country into what they wish it to be. Finally, the idea that only “liberal” justices are “activist” is not just wrong, it is literally impossible (everyone uses a combination of actions and omissions to achieve their desired results) and only displays the utter foolishness and ignorance of the accuser. Yes, it’s true I believe liberal justices are more activist than conservative ones, particularly in Commerce Clause cases – but your point is well taken, they exist on both sides of the aisle, and I should have referred to activist judges. It’s also true there is more interstate commerce than ever before – however, what that has to do with abortion and gun ownership still eludes not only me, but several sitting Supreme Court justices. This is just the tip of the iceberg. Title companies will stop insuring. Homebuyers will be afraid to buy, not knowing if the seller will try and re-claim the house later. The bottom is that title insurance will be more expensive. So guess who pays? You’re right. The costs get passed on to the consumer. A friend of mine says that the foreclosures are run through the same sordid process that originated them in the first place. Ashes to ashes, fraudulent paperwork to fraudulent paperwork, watersheds to watersheds, farms to farms. It is as always all about the looting, about one law for them and another for the rest of us. For those who think this is justifiable, just consider how the courts would grind you up and spit you out if you tried any of these tactics. Be that as it may, the usual hook into federal preemption is through the Commerce clause. Not real sure how that would apply here unless the banks and/or servicers are out of state. You can say the Wall Street banksters are corrupt and I agree, but there are lots of other people all over the country participating in this corruption. The anger focused on the few bankers at the head of corporations is wildly misplaced. Your neighbor working for law firms and companies like ProVest are corrupt too. Jobs are hard to come by? That’s no excuse. We should all be ashamed of ourselves. Nah. The anger focused on the few bankers at the head of corporations is exactly where it needs to be. If all these banks had gone through a more normal BK process, all of this would have come out in the audits. Once this mess was exposed, all the subcontractors would have been stopped. Just because the name isn’t served doesn’t mean the owner of record didn’t know about the procedings. These names could be renters, or they could be people who were previous renters. The John Does are sent in case the people living in the place just moved in. Spouses are also serviced, in case they claim ownership. Also, notice that a number of these are for Unknown Spouse or Unknown Tenant, also just a precaution by the mills. Any linked name that the mill lawyer can come up with is serviced, just in case. MERS is also noticed, although the company just throws those away. From the lawyers’ perspective, it’s just easier to notice all. So you need to do more data cleaning with this info before you can say how many of these notices pertained to the real owner of the note or mortgage. And I think your source knows that. Individuals not being served is not the issue. If it were done properly, and the defendant could not be found, the summons is returned without being served. What is being documented here is the summonses are being “lost” so it appears they are not even attempting service. There is a reason everyone is named in a lawsuit that may have a possible claim. If they are never noticed, they can not defend the allegations, face their accuser. This is not about people in default anymore, it is about following the rule of law that has been blatantly disregarded across the board. Eventually this foreclosure crisis will be over and then what type of judiciary will we have then? If it was okay to “lose” the summons, fabricate documents, ignore the rule of law, lie to the courts and deprive people of their constitutional rights in foreclosure, why not continue to allow it in any other area of the law, because hey, it worked in “foreclosure law”. Yes, the article here is about individuals not being served. There are other reasons to notify parties about a foreclosure, such as informing renters that the property is under foreclosure. Doesn’t always mean they have a right to the property, just that they are a party to the lawsuit. As a part of the overall problem, this issue is a red herring. There are eight cases listed above, but only two names that appear to be possible owners. (The heir could be a third possible owner also.) Maybe one of those two is an owner, but maybe not. So to extrapolate 20,000 affected cases from the data is not supportable. Finally, it’s the assumption that the Florida courts are “kangaroo” that allows people to believe that a simple process such as document service will trip up these guys. Florida judges, particularly the lead judges, are as sharp as they come, and they’ve been favoring their keepers for a long time down here. This isn’t what’s going to get them. The judges knew what was going on with these foreclsures — they’re experts on the documents, not morons — but they’re elected down here and you can guess who contributes — other lawyers and big business. (See Bob Norman at dailypulp.com for all the details.) I’m still waiting for the article to tell me how much the big foreclosure mills down here have contributed to the campaigns of the big judges. Just like Cedric and Diogenes, you seem to be advocating rule by strong men. These judges are not untouchable, they are not above the law. Xcept I think Diogenes was being facetious or a commie looking for an honest man or something. How would I prove that my property belongs to me? If through some mistake of paperwork, my property were foreclosed upon, how would I respond? Proving you made you payments is pretty simple. Use your bank records. Proving you own the property is the big problem, because you or your lender may have been stuck with a bogus title if you bought in the past few years. If you haven’t been paying, and a summons guy comes to the door and you hide under the kitchen table, or even if a lowly postman sticks a foreclosure notice in the mail which you need to sign and return acknowledging receipt, and you then feed it to your dog or lawyer, then you should probably think you are being foreclosed on, and it shouldn’t come as such a big shock. If you have a document that gives color of title and you have been paying the taxes, depending on the state 5-10 years gives you the property by adverse possession. For that if no one challenges you on the property saying you do not have a right to it, thats the key element, openly occupying the property without the permission of the claimant. So unless claims are filed within the time period, the claims do just go away. You should of course keep all your paperwork from the closing when you bought the house. If your servicer has changed you should keep the notice from the old servicer telling you the new address to send your payments. And you should keep the proof that your payments were made, and actually cashed, by the right entity. Then the other important thing is to have title insurance, and know how to contact your title insurer if you need to (should be in the above-mentioned closing paperwork). Be careful, in some states title insurance isn’t what it seems – in WA, you need to buy an “Extended” policy to get real protection (the “Standard” policy only protects your lender). Wouldn’t a general bailout of the population make these problems go away? How hard is it for the US Treasury to send every American adult a big fat check which would on average allow every underwater mortgage to be paid down to market price levels? Of course this won’t be done anytime soon (though it would save Obama’s Presidency) so we get to witness the population turn on each other as the money supply (but not the pie) shrinks. If that works, they would have already tried it in 1777, and the United States of America would have gone away by 1780. Really? So only private bankers can safely create money with 20-30 to 1 leverage? So how about we ban fractional reserve lending and let the government create 20-30 times the amount of real, PERMANENT money? So there is no free lunch except for the government backed counterfeiting cartel? Moral hazard: The danger that the population will wise up to the banking cartel. If money creation cannot create wealth then why do the banks engage in it every time they make a loan? But even if money creation cannot create wealth, money destruction can DESTROY it and/or transfer it to the bankers. Wise up. Those who protest money creation are mostly the bankers who do it every day and wish no competition. Money creation is not the problem in that case. Moral hazard is. “Free bailouts for everybody” rewards foolishness and punishes prudent behavior. The State Department issued an alert on Sunday urging Americans in and traveling to Florida to be vigilant about signing any contracts, naming real estate contracts as one source of the concern. They have raised the threat of fraudulent contract terrorism in Florida to “high” from “general”. The decisions to caution travelers come as counter terrorism officials in the United States assess intelligence about possible increases in fraudulent contract plots originating in; Florida, California, New Jersey and New York. A “travel alert” of the kind issued Sunday is considered to be far less disruptive than a “travel warning” that would advise Americans to stay away from certain high-threat areas like banks and brokerage firms all over the country. The dilemma for authorities will be how best to inform the public of a threat that intelligence analysts believe is real but whose contours remain vague – “credible” but not “specific,” in agency jargon. They honored my bonus contract, even though every penny of my company’s profit was a fraud. The taxpayer financed the payment anyway. Guess it’s just because I’m a “talented” banksterhino, unlike all the little people. Anyway, when I buy a house, my lawyer just transfers funds. What is new about deception? Humans aren’t even the only animals who deceive. Deception and deceit have always been rife. What is new is a frictionless medium in which to discus it all. The question could be…is it any worse now than it ever was? Are we on the edge of a precipitous national epiphany about trust or have we actually moved away from the edge because vested interests are aware of the scruitany directed at them and consequantly less audacious in what is attempted. Amid all this legal minutia you’ve failed to give credit where credit is due. This is the most effective fast-track land reform program since Mugabe de-colonialized Zimbabwe. So if what’s happening is people are having their homes stolen, and specifically in order to enrich the folks at the top, shouldn’t more attention to be paid to the specific individuals who bear responsibility? I mean, ProVest is not some faceless entity. Gee I wonder if Victor ever audited Countrywide? Oh well. The more one reads and looks at this stuff the more contrived it all seems going back to the late 90s. These guys seem all very much ‘in place,’ after illustrious careers in other financial chicanery, to take the foreclosure baton. One ponzi fraud after another. Thank You – Yves for continuing to report on this. If we continue to allow all this illegality to occur, sooner or later, we will be all be bank chattel. Let’s hope we get a clue before that. Consider the situation. Large banks wrote very questionable and risky mortgages and then sold them through group tested marketing vehicles to everyone, including NINJAS. The banks went bankrupt. Allowing them to go into Chapter 11 would have necessarily re-priced millions of those mortgages and re-established the market. But the government used taxpayer dollars to prop up those banks, including the politics, the regulation, and the financial positions of most of that hierarchy. Now, those same banks are foreclosing on taxpayers, their mortgages left without repricing even as the whole market is attempting to do so, and many of those taxpayers lost their jobs because of risky banking. I smell a moral hazard. And there is definitely a rule for them, and a rule for us. Smell it? We’ve been wading in it chest deep since the bailouts! Moral Hazard – pooped, scooped and blended by Wall St, sniffed and approved as genuine by Turbo Tim. auctions and make insider bids to acquire those properties; and blighted neighborhoods. Fraudulent foreclosures ensure the success of FABRICATED BANKRUPTCY COURT ‘Lift Stay motions’ and false ‘Proof of Claims’. manifest fraud and criminal activity being carried out by people with credentials to practice law. Equally ironic is the reality that some people pretending to be annoyed about “deadbeats”are the actual people who are participating in real estate racketeering –fully sanctioned by the majority of courts, especially Bankruptcy Courts! It is not a shocking development at all. Its a pro-business, conservative Republican State. The formula is to lie about everything. Reasons for going to war, torture, evolution, global warming, Halliburton, etc. Look at all the anti-gay congressmen that turn out to be closet homosexuals. I think Florida sets the record in that department. Why not lie about who owns what? Seriously, what did anyone there expect? Equal rights under the law? Did they think only “other” people would have their rights violated? The corporations running the country are corrupt. Quelle suprise! We haven’t seen anything yet. And we probably won’t see a lot of it. Respectfully, what exactly does anything in this sordid mess have to do with pro-business or free markets, or for that matter now, Republicans? This is the result of government meddling at its best, not worst. This is crony capitalism at work. We could easily all be watching the collapse of an economy here. Many folks have been saying that when Main Street perceives that government and big business have stacked the deck, which was the first and foremost problem with TARP, and then the politically based stimulus, that we would introduce corruption into the system that is almost impossible to reverse. The idea that banks on Walls Street could handle this mess was absurd. They should have been allowed to fail. That was the pro-business thing to do. That was the honorable thing to do. As a citizen of the state of Florida, it upsets me to know that our court systems aren’t handling things constitutionally. Someone needs to crack down. I can’t stand anything unjust and it’s really just sick that people are getting their houses taken away without notice. I’m sure this is what our founding fathers had in mind when they ratified the Constitution. This post should have a Banana Republic icon alert symbol on it. I feel this is a part of your liquidity questioning above; the faster way of business, and questions about the SCOTUS equivaleny ruling on citizens and corporations. For a heads up on where we’re headed google “The United States of Argentina” and follow the link. For those who believe the Tinfoil Hat is on to tightly ask yourself this – How long can we remain a first world country if we become ‘governed’ by the third world ‘rule of gold or whim’. shocked. We are the low price leader, third world is us, thanks Washington. A posting of the KY RICO suit and some comments. Haven’t read it all myself, but shows the tip of the iceberg about what’s to come. I paid my NON-SUBPRIME mortgage for 7 years prior to marriage. When a foreclosure mill lawyer fraudulently foreclosed via a defunct lender’s identity, the courts castigated me for not cooperating with frauds being perpetrated upon me, as that lawyer used the defunct lender’s identity, and filed Bankruptcy “lift stay” motions and “proof of claim” documents under Wells Fargo’s name. Years later, using the non-existent lender’s identity, a ‘simulated’ auction (in my absence) took place and an inside bid was made –even with a federal court Affidavit from a “SUCCESSOR” mortgage company. Still, the foreclosure lawyer had the property deed recorded into the name of the non-existent lender. Months later, the newspaper showed Freddie Mac as paying the non-existent lender over 86,000. Then, Wells Fargo filed a false IRS form 1099-A. I didn’t know Wells Fargo had gotten in on the act until I received an IRS tax bill.